Hawkins Outfitters is committed to increasing the skill and knowledge of fly anglers by offering fly fishing schools that no one else has. Rather than compete with both shops and clubs that have great basic casting classes, Hawkins Outfitters has fly fishing schools that teach you how to fish. Our schools are designed to take anglers that already have a basic knowledge of fly casting and teach them how to cast and fish like an expert. How many times have you stood in a local stream and couldn’t catch fish rising around you? Seen a rising fish that you couldn’t reach or get a dead drift over? Had bonefish within casting range but the wind gave you problems? These are the problems Hawkins Outfitters will help you solve. If you want to try saltwater fishing or are going to any of the exotic places around the world that anglers always dream of visiting, you need to be able to deliver a fly accurately at least 75 feet. If you can’t we can teach you. Make a commitment to become a better, more skilled angler this year. 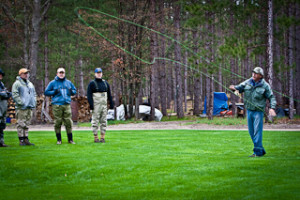 Come join us at one of our fly-fishing schools that will help you become a better angler! Taught on local rivers like the Pere Marquette and Manistee. Check with us about which rivers a specific Fly-Fishing School will utilize. 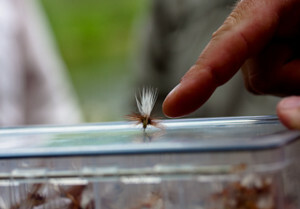 Anyone interested in expanding their approach to fishing dry flies and matching the hatch? Join Hawkins Outfitters and learn how to expand your dry fly fishing opportunities for trout on Michigan streams. This School will cover everything from basic entomology to fly selection to fly presentation. We will discuss rigging, reading water, hatch timing, bug collection and the power of observation! Trout feeding behavior is also very important to us as anglers and we will cover the different feeding behaviors and help students to interpret the how, where, and what the fish are doing. The importance of entomology in dry fly fishing is equally important and we will help students to identify some of the most important hatches in our area such as Sulphurs, Isonychia, Brown Drakes, Mahoganies, and Baetiscidae. We will also work with students on basic and advanced casting techniques to present your flies in any situation! The class will be taught on the Upper Manistee River. The cost of the school is $250 per person. Contact us via the web or email if you have any questions. “Thank you for a very enjoyable, informative Dry Fly School. I got exactly what I wanted out of the instruction. I can’t think of one change that would benefit anyone attending this school. I have made notes of fly selection. I have a better understanding of bug identification. Especially helpful was casting instruction and hook setting. Your advice also confirmed my preference for a 5 wt rod for this type of fishing. This two day school is all about casting, presentation, fly selection etc. We will begin each day on the lawn working on distance, accuracy, hauling, reach casts etc. After that we will get on the water and practice the areas that you need improvement. This class is all about taking your fishing to the next level. If you’ve been in situations where you needed more distance, a better drift or greater accuracy this class is for you. The cost is $500 for the two days all equipment and flies provided. Contact Chuck Hawkins for additional information and to book this school.